Embedded or on-board controllers for wide format copiers provide a ‘computerless’ networked solution that is adequate for plotting one-at-a-tme drawings or push scanning to a folder or mailbox. 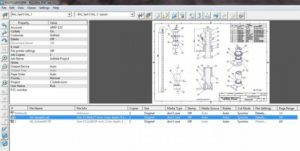 In general, an embedded solution is an easier to use interface with less plotting or scanning controls than a high production environment such as a print-for-pay or large engineering firm requires. While the embedded controller workflow provides the hardware connection required between the network users and the wide format copier, throughput performance or the ability to perform certain batch plotting or production scanning tasks may be lacking depending on a user’s needs or expectations. – Automatic media roll & format size selections, even for custom page sizes / odd sized originals. The optional PLOTBASE|PM SCANBASE application also provides controls for production scanning plus image editing features for B&W + Color images. Administrator controlled plot queue helps prevent plotting mistakes, provides easy replotting for hundreds of jobs, allows plotting admin rules, alerts on plot setting issues and can preview any job before plotting. Insert, delete or drag files into PLOTCLIENT|WIN. TIF, PLT, HP-RTL, JPEG optional PS/PDF, DWF/DWG and other formats available. Unlimited user seats for each PLOTBASE|PM solution.